Blessings," our English rendering of Hebrew b’rakhot, are offered by Jews when fulfilling a mitzvah, which acknowledges the many occasions of life ~ including Shabbat and holidays ~ when and as they occur. Shavuot and Simchat Torah are represented by the central feature – The Torah scroll, enfolded in a tallit. Hebrew phrases accompanying the symbols include: the priestly blessing; the Torah being presented by Moses to the people; and the entreaty at Neilah asking for the gates of prayer to remain open. The Cabbalist, R. Moses Cordovero, asserted that “every Hebrew letter has a spiritual soul.” His words are preserved along the Mosaic’s top and bottom margins. For Ruth Merritt, a lifelong relationship with art and Judaism began with a misunderstanding about a Hebrew school assignment: to copy the first paragraph of the Amidah. At 6 years old, she took that directive literally, reproducing the exact shape of the Hebrew letters. Although she didn't finish copying the paragraph, she discovered that she enjoyed drawing the letters. And instead of a reprimand, she received accolades and support. Merritt studied both Judaism and art as a young adult, attending the College of Jewish Studies and the Art Institute in Chicago, the Seminary College of the Jewish Theological Seminary in New York and the University of Judaism’s School of Fine Arts in Los Angeles. 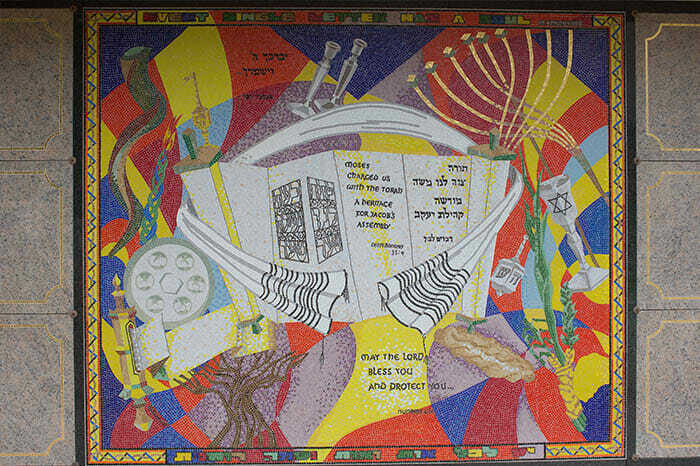 Her projects include the lettering on Aron Kodesh doors at several Los Angeles synagogues and the design for Torah mantles at Sinai Temple, which also houses her brazed steel sculpture, “Memorial to the Six Million.” Her exceptional work in the Kamenir Chapel, faceted glass windows “Creation: The First Six Days” at Mount Sinai Memorial Park’s Simi Valley has been specially recognized. Her latest work for Mount Sinai Memorial Parks is the beautiful design of the wall mosaic, “Blessings”, located at the Hollywood Hills park. Ruth Merritt has worked in oil, gouache, acrylic and metal; she has utilized papercut, painting and calligraphy to great aesthetic advantage in a number of commissioned pieces and in a limited edition papercut ketubah. Her works have been exhibited in venues in southern and northern California, in the Midwest and in Canada. She co-authored a lecture on the ketubah and wrote an article, “Women’s Rights in an Ancient Civilization”, in the Journal of the Los Angeles Society for Calligraphy, Fall, 1995. Among other articles highlighting her work, the 1986-87 Yearbook of the Encyclopedia Judaica featured her ketubah in its piece on Modern Hebrew Calligraphy.